Regardless of your industry or role, something essential keeps us all from descending into chaos: a mutual dedication to standards. While conforming to standards may sound restrictive and limiting at first, they establish order and day-to-day simplicity. Consider education; without standards, students are very likely to learn key concepts out of proper sequence. Upon progressing to the next grade level, some K-12 students may be significantly ahead of others in some subjects while lagging behind in others. The skewed playing field would only be magnified at the global university level. As such, standards are implemented for a reason. They keep us grounded and working together with the utmost efficiency. The eLearning industry is no exception! 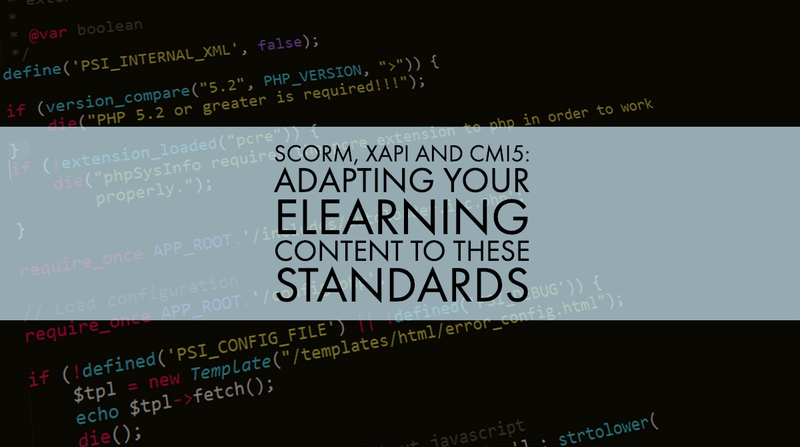 To establish consistency in the development and interoperability of digital learning content, three standards have been established: SCORM, xAPI, and cmi5. To start, we need to understand the key differences and overlap between each standard. If you’ve ever taken an eLearning course or have authored educational content yourself, you've been exposed to or are familiar with SCORM. Standing for “Sharable Content Object Reference Model,” the first version of SCORM was developed nearly two decades ago. At the time, creating eLearning material that worked effectively on multiple systems was costly and challenging - much more so than it is today. Collaborating between programs with other content developers was a frustrating process. SCORM was the solution to this dilemma. SCORM offered software developers a set of uniform guidelines to make content integration much less complicated across systems. By providing developers with this standard of technical specifications, it was possible to create digital learning platforms and authoring tools that could easily communicate with each other, allowing content of all types to dynamically move between them. If a course is advertised as SCORM compliant, this means it should work smoothly with any other compliant technology. It’s possible to purchase a SCORM compliant LMS only to find your interactive courses failing to track as they should. Why might that be? To advertise a program as SCORM compliant, the program must only apply the required elements of the model; your courses may have non-required elements. To further confuse matters, there is also an outdated version of SCORM. To avoid unnecessary challenges, check to make sure your LMS is compatible with SCORM 1.2 and that it complies with both the mandatory and optional components of the standard. As digital learning continued to advance in its capabilities and applications, it became clear that SCORM needed to become more versatile. It is essentially designed to track answers to questions and pass, fail, or completion results for assessments. Today, it’s much more practical to collect a wider range of data from numerous sources. That’s why Experience API, also known as xAPI, was created. Outside of more static pass/fail metrics, xAPI compliant programs track data through action statements. For example, seeing “James R. downloaded the Chapter 8 Study Guide on mobile.” Given that students are likely to access your content in a number of ways, it's very useful to identify access and usage trends. Seeing this birds-eye view of activity helps educators create more individualized learning paths and adapt their content based on student user behavior. While cmi5 was originally primed to become a SCORM and xAPI replacement, its actually become a support system for them. In fact, cmi5 optimizes SCORM and xAPI by layering in more capabilities while at the same time simplifying the overall data model. For example, it allows tracking of offline learning. As for the simplification piece, we mentioned how SCORM has optional data elements. cmi5 instead puts forth the bare minimum data elements required that would work across most learning domains e.g. score, status and time. If the LMS and content creation tools you’re using are compliant with these standards, you shouldn’t have to worry too much about the technical aspects. The developers behind a quality LMS will have done that for you! That said, it can be helpful to understand how the car you're driving works before getting behind the wheel; if an issue crops up, having that layer of context makes it easier to address. Gutenberg’s in-house LMS allows publishers and educators to easily create SCORM-compliant courses, avoiding common technical difficulties to free up time for more strategic content creation and innovation. Want to learn more?